Last updated on Nov 20, 2010 Originally published on September 12, 2010 by malihu, under Templates & web apps. A simple, yet elegant fullscreen image gallery created with the jQuery library and CSS. 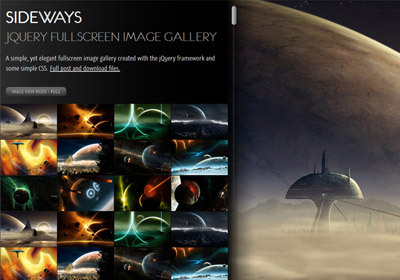 The gallery features fullscreen images in various modes and custom scrollbars. view demo Alternative demo with native browser scrollbars and click to open panel mode. Very nice piece of code, thank you! I adapted it to remove the hover’ing (quite headache inducing) among other small improvements. Hi! this is an awesome template! thanks a lot. I’d like to fit this inside a div instead of using it fullscreen (because i want a banner to be on top of it all the time) ¿Is there a way to do so? Great and usefull for web development and grafic arts in web sites, very important tool. thx from colombia. How do I view images in a folder ? But how can I tell SideWays to view them? I cant seem to have this exactly as you do, all the png’s wont load. Do I need to make them special? It’s beautiful, but how can I insert a comment for each of images? Hey there, Your work is great..at last I found an image gallery that I can use in my project..thanks so much keep up! God bless!